I already used this pattern once, my first Take Heart was done last January. Somehow I was never quite convinced of it, the metallic thread in the yarn and the fit just weren't quite right. Which is why I gave away the first version a while ago. But the pattern stayed in my head and when I won four skeins of Brooklyn Tweed Quarry I was curious to see if I could use it for a new version. The Quarry is unlike any yarn I've used so far. It has a unique texture and I had to be very careful not to break it while knitting. It smells of sheep and of being outdoor and the Sulphur I used has a lot of tiny flecks of colours in it. The hat felt rather stiff before I soaked it but then it bloomed and now it's comfortable to wear. I wanted a real alpaca pompom for it, I think the fluffyness works very well with the coarser texture of the yarn. I am kind of undecided on the Quarry after this hat. 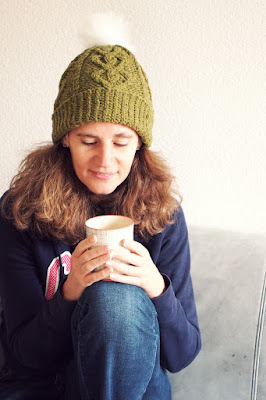 It was very intense to knit with and I prefer softer yarns but I am very happy that I had the chance to work with it because it was so different from what I usually knit with. What a pretty hat! I have never had the opportunity to see Quarry in person so I found your observations interesting. It has an almost waxy texture and it is soft but in a different way from other soft yarns. Love these heart cables! So cute! I love the 💚 too. 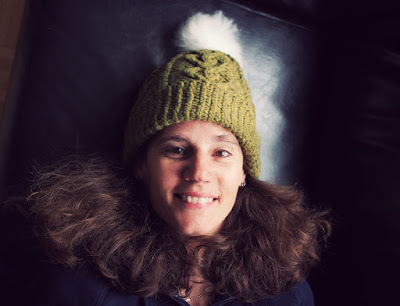 That hat is beautiful, definitely worth re-knitting! 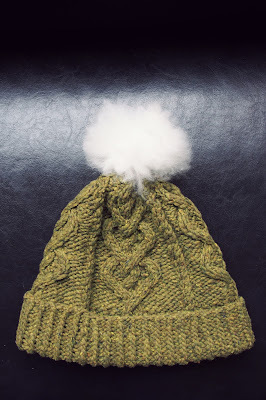 I have a skein of Quarry earmarked for a Halus hat, I'm excited to try it! Love your pom pom. I'll have to check out the Halus pattern, after all I still have three skeins left.